Montague took command of HMS Robin (T65), a river class gunboat, now the boom defense depot ship and mother-ship of the 2nd MTB Flotilla on 10th February 1940. 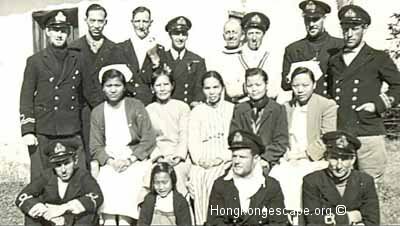 Left: Commander Hugh Montague RN (Ret) with Lt-Cdr Henry Hsu ROC behind. With the outbreak of hostilities with Japan on the 8th December 1941 Montague was appointed Senior Navy Officer Aberdeen. HMS Robin was scuttled in Aberdeen Channel on Christmas Day just prior to the surrender. The two 55 foot ex Kuamintong CMB's Kuai 19 & 20 completed in 1938 did not have sleeping quarters, and therefore the crews messed on board Robin. Montague was was also the Senior Naval Officer (SNO) Aberdeen and was responsible for commandeering suitable vessels needed for the hastily appointed dock. On the 9th December the Tug C410, two navy lighters and the cabin cruiser Vanla which belonged to Chief Petty Officer writer Felix Hill moved from Victoria Harbour to Aberdeen. 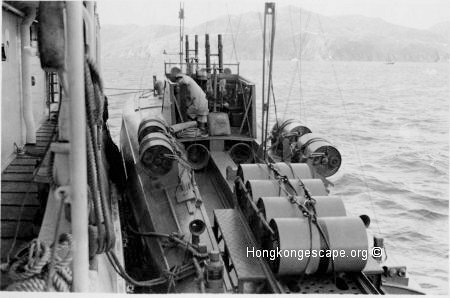 On the 12th Montague requisitioned the Vanla for running supplies between Aberdeen and Repulse Bay during the battle. .
Sub-Lt Bush HKRNVR: "There was one grand, middle-aged commander named Montague, who had been brought out of retirement. He'd entered the Navy at thirteen years of age, bred in the Nelson tradition. Just prior to the war he had sailed from New Zealand to England in a tiny yacht accompanied only by his newly-wed bride. The news simply dazed him for the moment; he then crashed down his fist upon a table and said: "Surrender! The Navy does not surrender. I fight on!" Cmdr Montague escaped from Aberdeen on Christmas Day on board the 150 ton berthing tug Polly (C410) and joined up with Adm Chan Chak's escape party at NanAo, deep behind enemy lines in China. Later completing the 3000 miles journey across China and Burma and arrived in a deserted Rangoon. In March 1942 he was appointed Senior Naval Officer Chittagong before returning to New Zealand. For more information on Cmdr Hugh M Montague RN (Rtrd) Click here. 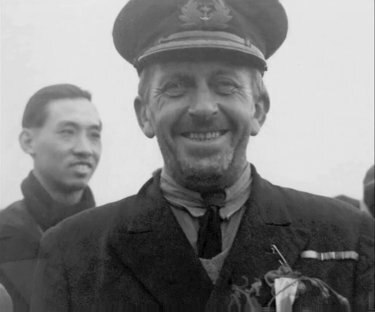 Commander Montague was Mentioned in Despatches "For good services in charge of a party who made a daring escape by Motor Torpedo Boat from Hong Kong" and honored with an OBE . 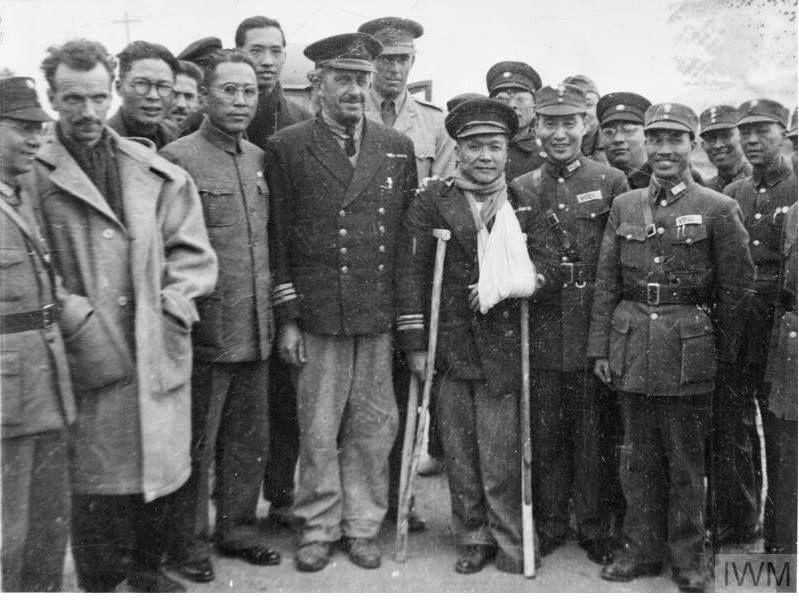 Montague was featured on the front page of the Daily Express along with Admiral Chan Chak during the escape. 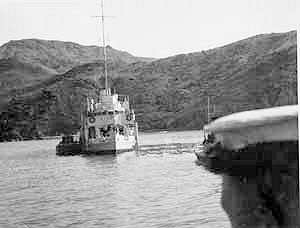 HMS Robin with MTB 27 alongside. 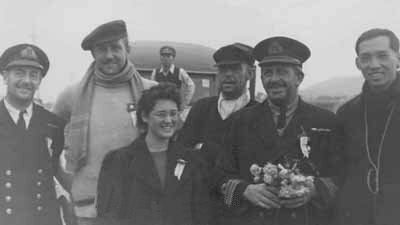 Robin was the MTB Flotilla's mother ship and as MTB's 26 & 27 did not have sleeping accomodation the crews messed on Robin. HMS Robin with MTB 26 or 27 alongside. 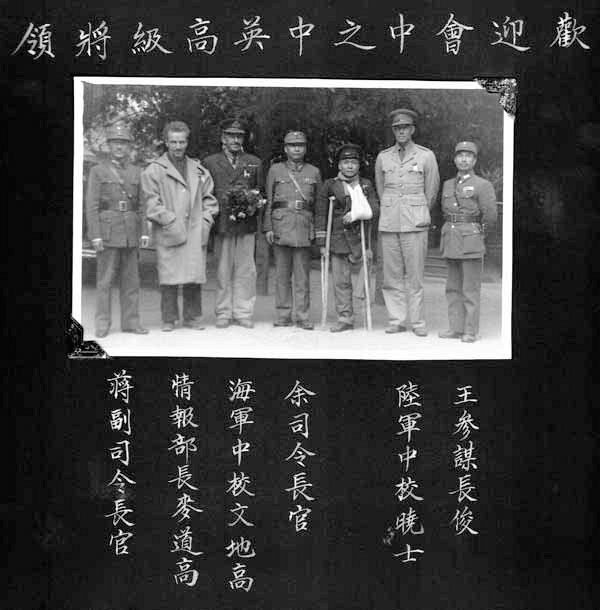 Deputy Commander General Jiang Guangnai, David MacDougall, Commander Hugh Montague RN, C-in-C General Yu Hanmou, Adm Chan Chak, Lt-Colonel Harry Owen-Hughes, and Chief of Staff General Wang Jun at at Binlu, Shaoguan (Kukong) 6th January 1942.